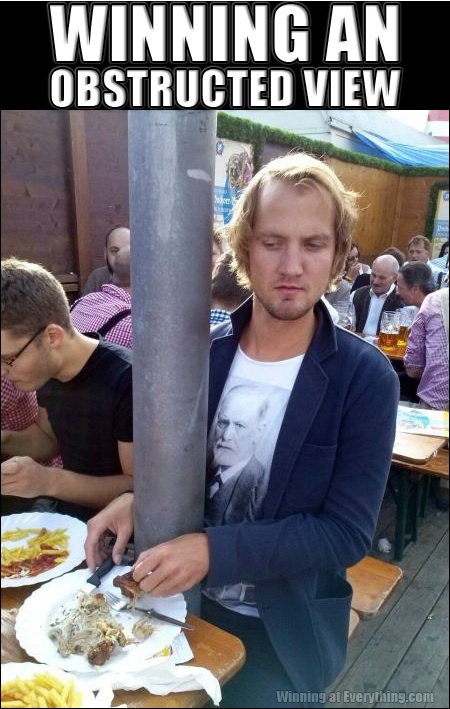 Sigmund, sometimes a pole between your legs is just a pole between your legs. Memories… one place I used to work, they discovered the roof trusses were starting to give way. To give time to arrange a more permanent solution, they installed posts every ten feet, no matter where. One went right through a booth, but the worst was in the grill area. After putting the lettuce or cheese or whatever on each sandwich, you had to walk around a pillar, then pull the sandwich through to put on the meat, then back around the pillar to start the next one, hundreds of times a shift.